Heatley Hall is your classic church hall. This light, bright space incorporates the church's original architecture and is perfect for events for up to 150 people. Are you planning a birthday party, wedding, funeral wake or charity event. We've got enough space for dancing for the grown-ups, or a bouncy castle for little ones. Trestle tables and chairs are provided so you can set the room up however you need for celebration dinner, quiz night or charity fundraiser. The kitchen is right next door and has a six-hon burner so you can cater for your event in style. Copleston Centre is easily accessible from Peckham Rye and East Dulwich stations and we are on plenty of bus routes, so it's easy to gather friends and family from South London and beyond. This is your space in the heart of the community, so please make the most of it! Size 9m x 16m (30ft x 50ft) approx. Capacity 150 (up to 15 x trestle round tables, 150 padded chairs available. An extra flat fee of £50 for the hire of the kitchen which we will also provide an additional space of the café included in the price. All other times: £50 per hour. Availability: Weekdays - Monday 9.30am-7pm, Wednesday afternoon 3pm-5pm, Friday morning 11.30am- 2.00pm Weekends Saturday - 1pm - 5pm - 6pm - 11pm Availability of hours outside the above are charged extra. 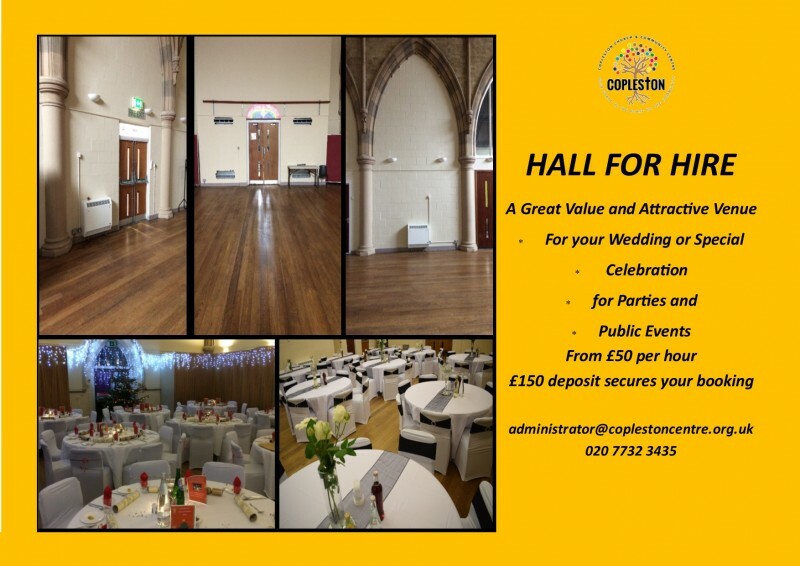 Hire Costs: Heatley Hall - Weekday - £40 per hour £20 per hour for a registered charity £30 per hour regular group Heatley Hall - Saturday 1pm-5pm - £200 6pm-11pm - £300 All hours outside of these times are charged at £50 per hour Flat fee of £50 for kitchen hire and café area. Tablecloths and chair covers - prices available on request. There have been 0 reviews of Heatley Hall. Perhaps some of the following halls within 5 miles of Heatley Hall would also be of interest?